Matai si Sinot Jose Mata Torres gi ma’pos na mes. Desde 2013 hu ayuyuda si Sinot Torres gi i lepblo-na. Dumångkolo gui’ antes di gera ya gumai’idat gui’ gi duranten i gera, ya gof malago’ gui’ muna’fitme i hinasso-na siha gi un lepblo, ko’lo’lo’na i estoria put anai i Chamorro siha gi sengsong-na manachu ya ma puno’ i Chapones giya Malesso’. Gi ayu na ha’ani ma “liberate” maisa siha. Gi Febreru gi este na sakkan mana’huyong i lepblo-na, i titilu-na “Massacre at Atate.” Achokka’ mas umatungo’ ham put este na cho’cho’, guaha otro maolek yan gaibali na che’cho’-na gi kumunidat. Anai hu hungok na matai gui’ mandiside yu’ na bei fama’tinas “tribute” para guiya. Macho’cho’ gui’ gi KPRG gi rediu komo host para 20 na sakkan. Pues para i sho “Beyond the Fence” mama’tinas episode put i maolek na bidå-ña para i taotao-ta yan i kumunidat Guahan. Estague i infotmasion put i episode. Anggen malago’ hao dumownload i episode komo podcast, ono este na link. Mr. Torres died on September 28, 2015 at the age of 88 leaving behind a diverse list of accomplishments. 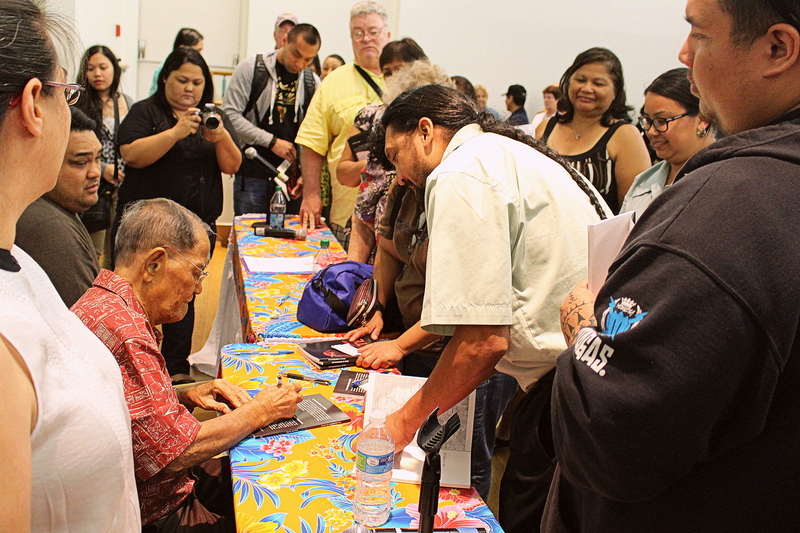 He was a war survivor, a liberator, a medical researcher, a connoisseur of classical music, a longtime radio host at KPRG, an author, and a proud advocate of saving the Chamorro language. He spent the last years of his life working towards the publication of a memoir of his war experiences, Massacre at Atate. He hoped that by writing this book, the suffering and heroism of the people of Malesso’ in a time of war might never be forgotten. This book was published by the University of Guam Micronesian Area Research Center (UOG MARC) in February 2015. Tags: Beyond the Fence, KPRG, malesso', merizo, Podcast, radio, Tiempon Chapones, Torres, WWII. Bookmark the permalink.